Burn 100 calories doing these fun workouts and lose up to 10 pounds in 30 days. It’s simple, just follow the instructions and you’ll be amazed by the results. There’s still enough time to reach your beach body until summer. So why not starting your weight loss journey with any of these fun ways to burn 100 calories? Some of these exercises can be done in the comfort of your own room, while others require special machines from your local gym. Just choose your favourite way to exercise and repeat it as many times as you can. The more you exercise, the faster you’re going to lose those extra pounds. Jumping rope is a great cardio exercise. It gets your heart rate up and gives your whole body a quick workout. Kickboxing is one of the best cardio workouts. It is using your entire body with every move, and is a fun way to burn 100 calories quickly. Alternating between jogging for 2 minutes and sprinting for another 2 minutes can burn over 100 calories in 10 minutes. Give it a try! Using the Stair Master for only 6 minutes will burn 100 calories and get a great workout for your legs. You can also climb stairs outdoors, or inside a sports arena. Jump on a treadmill and start running! After 9 minutes you’ve burn 100 calories. Or even better, get a breath of fresh air while running outdoors. Practicing yoga for 20 minutes will burn 100 calories. Attend a local class and practice yoga for an hour with an instructor! Swimming is a super-charged cardio! After only 12 minutes it burns 100 calories and gives you a full body workout. The best way to benefit from these 10 types of workouts is to choose one of them and perform it for about an hour each day. You can also mix them to your liking. For example, go for a full hour of swimming today. Then, tomorrow you can combine walking with running and sprinting for an hour. And so on. Now, exercising alone won’t get you to the point of losing 10 pounds in 30 days. But adding an appropriate diet to your weight loss regimen will definitely do the job. So exercise 60 minutes and cut a few calories every day and you’ll be able to lose 10 pounds or even more in just a month. Here’s a 7-day menu plan to help you jump-start your weight loss journey. You can follow this diet each week, or you can make your own menu plan. But remember, you should not exceed the limit of 1,500 calories intake per day. You’ll cut anywhere between 300 and 600 calories when doing one hour of the workouts presented above. The diet will also help you reduce your calorie intake with at least 500 calories. 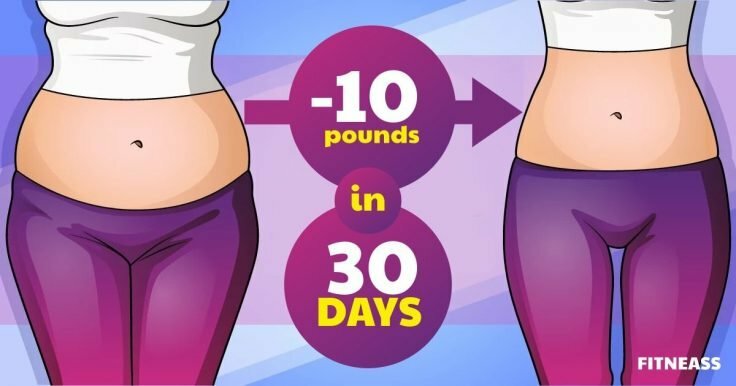 This means you’ll lose 10 pounds of body fat in 35 days if you follow this program precisely. You can rest assured that you’re going to lose at least 10 pounds in 30 days by following this workout and diet plan. 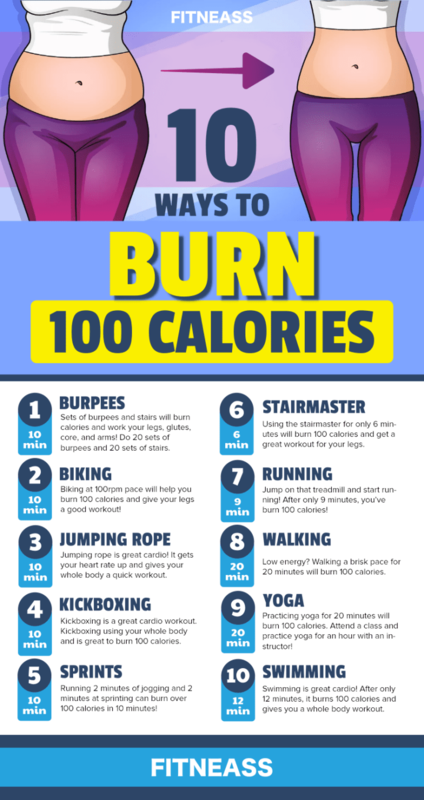 Remember, you can search for other ways to burn 100 calories fast. The possibilities are infinite. The key is to scale that workout to burn at least 300 calories in a day. Then cut a few hundreds of calories by ditching fast foods, sweets, and alcohol. Be patient, and the results will surprise you (in a good way). After all, weight loss is simple. We’re the ones that often complicate it by searching for shortcuts and gimmicks. In fact, weight loss resumes to eating less and healthier and to staying active every day. It’s that simple.